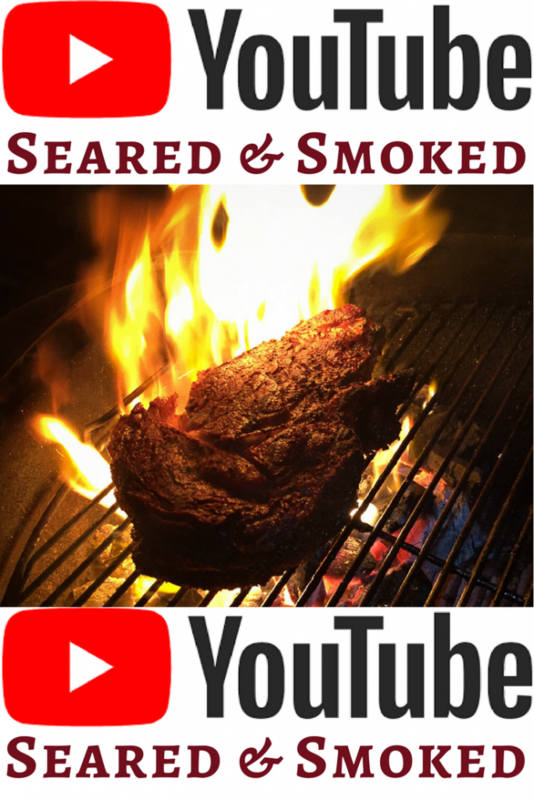 This is one of my favorite recipes for summer grilling, adding a lot of color and vibrant flavor to any dinner. When you already have the grill fired up for a steak or some chicken, it is too easy to throw on some fresh veggies for this Balsamic Grilled Vegetables recipe. 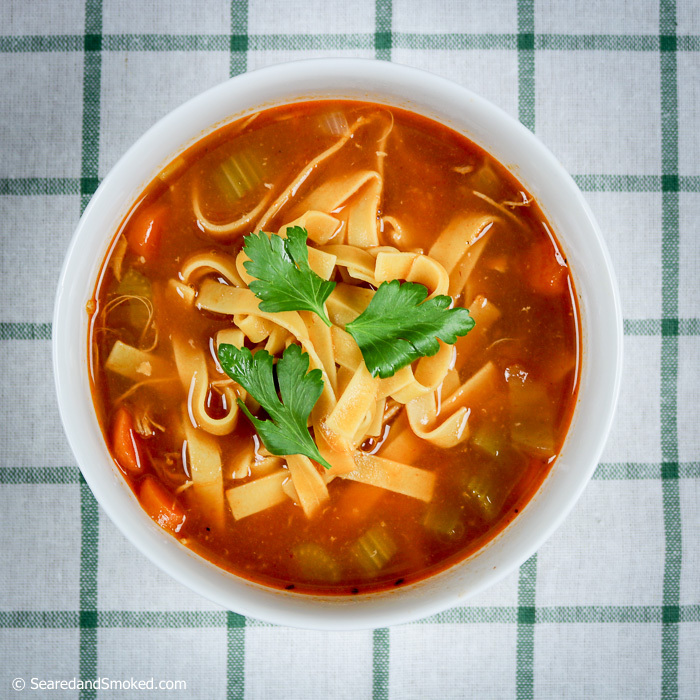 You can use any of your favorite vegetables. 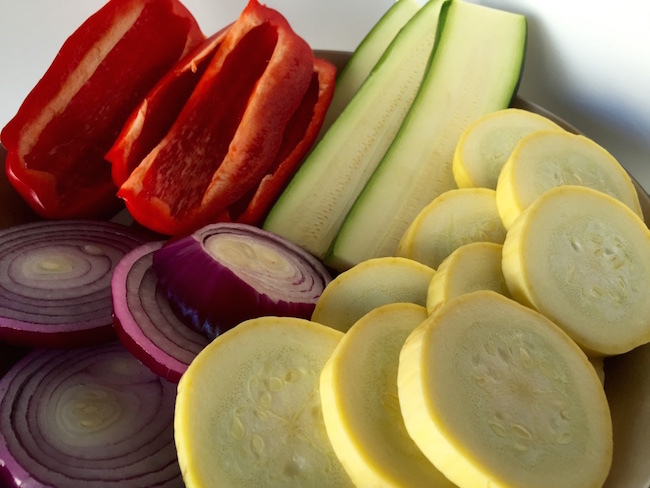 Some of our favorites are Zucchini, Bell Peppers, and Red Onion. 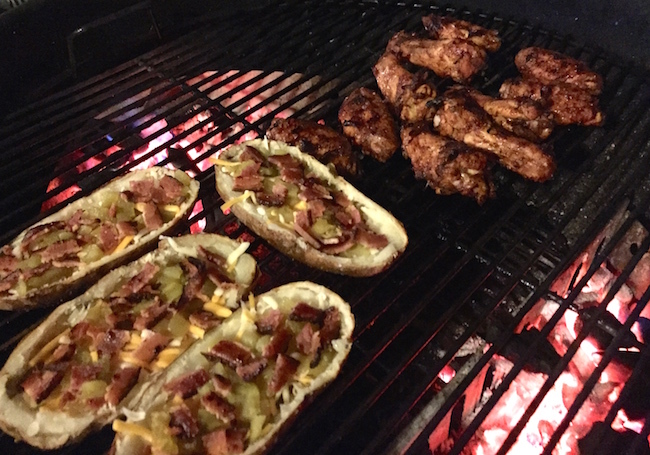 They are generally easy to control on the grill. You might lose a few onion rings in the process, but I usually do not have too many casualties. The process is quite easy. 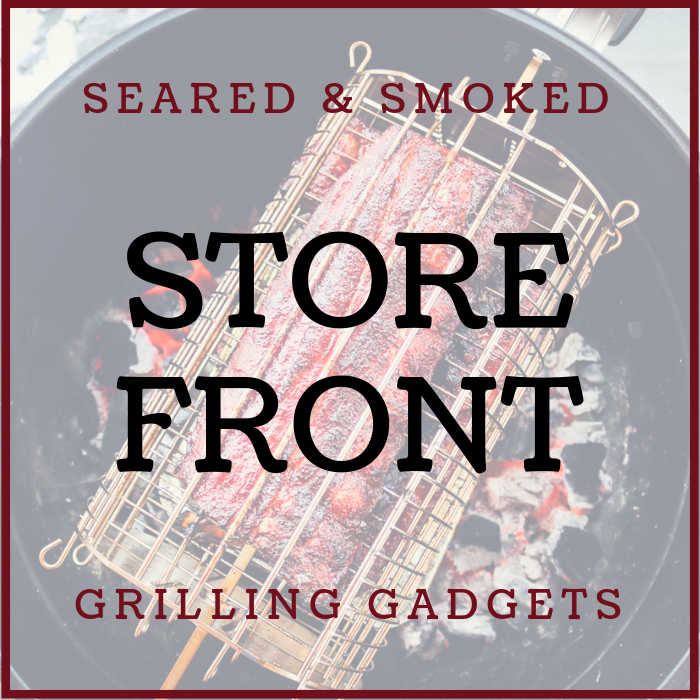 First, fire up the grill in the high heat range – around 500 F or more. 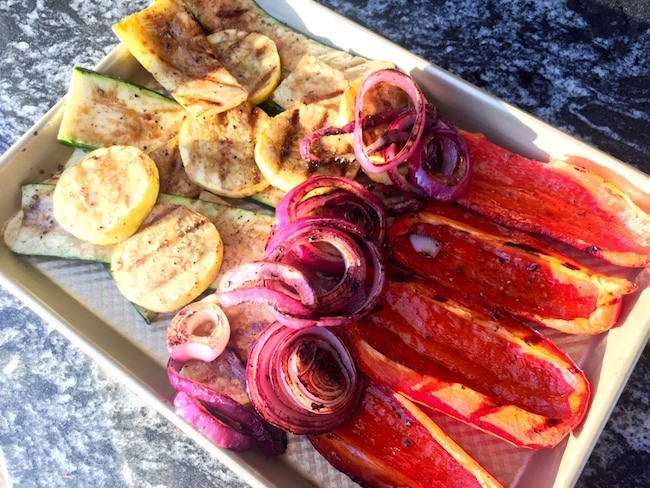 Zucchini I usually slice lengthwise into long pieces that are easy to handle on the grill. The peppers I will slice into 4 pieces per pepper, also making it easy to handle. The onions you want to slice against the core direction, so you have nice tight bundles of onion rings. I then put a light coating of olive oil on them to allow some seasoning to stick to the veggies. After coated, generously season all sides of the veggies with salt and fresh ground pepper. We now need to make a balsamic vinaigrette – a mixture of balsamic vinegar and olive oil. For applications like this, I beef up the amount of balsamic in the mixture, using 50% olive oil and 50% balsamic vinegar. 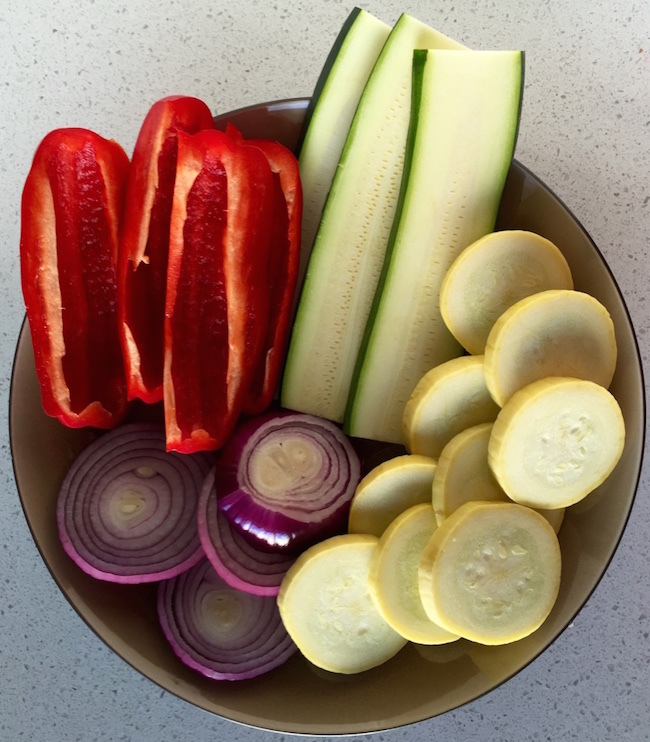 Because the vegetable are only going to come in contact with the mixture for a short time during grilling, I like to punch up the flavor with more balsamic than a traditional vinaigrette, which is 3 parts oil and 1 part vinegar. Whisk the mixture together vigorously to bring the mixture together into an emulsion – the vinegar will no longer look like bubbles floating around in the olive oil. You are now ready to grill. Place the onions on the grill first, as they will take the longest to grill. Apply your vinaigrette with a brush on the onions. Grill for 5 minutes and flip. Continue to grill the onions another 5 minutes before adding the others. Apply your vinaigrette every time you flip the vegetables. 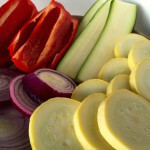 Place your remaining veggies perpendicular or at an angle against the lines of the grill grates. This will give you more surface contact and more charring on your vegetables. The more charring, the more flavor. The zucchini and peppers should only need 3 minutes a side. You want them to still have some body, not flopping around everywhere when you take them off the grill. Continue to mop the veggies with our balsamic vinaigrette as you turn, but you should not need to coat them as they come off the grill. You do not want the balsamic flavor to be over the top. Take them off the grill, and you are ready to roll. If you give these a shot, leave me a comment on what you think of them. 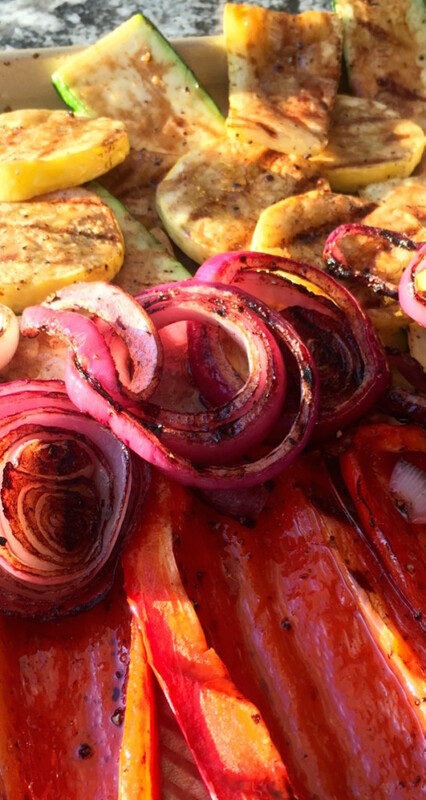 What are your favorite grilled vegetables? 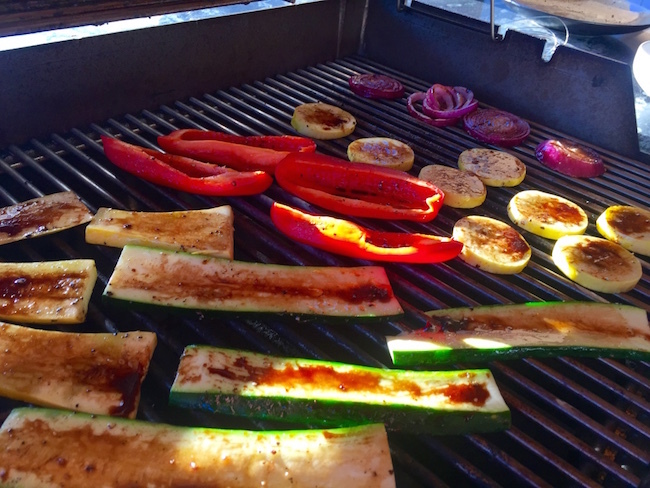 Nothing says summer like fresh balsamic grilled vegetables, adding beautiful color and vibrant flavor to any meal. Mix equal parts of olive oil and balsamic. Whisk together so the mixture is an emulsion - so you can no longer tell the difference between the oil & balsamic. Place onions on the grill. Brush on balsamic. Turn after 5 mins and brush again. Grill for 5 more mins. Place remaining vegetables on the grill. Brush with balsamic. Grill & flip all vegetables every 3 minutes until tender, but not floppy. Zucchini & peppers should only need one flip. All right folks. 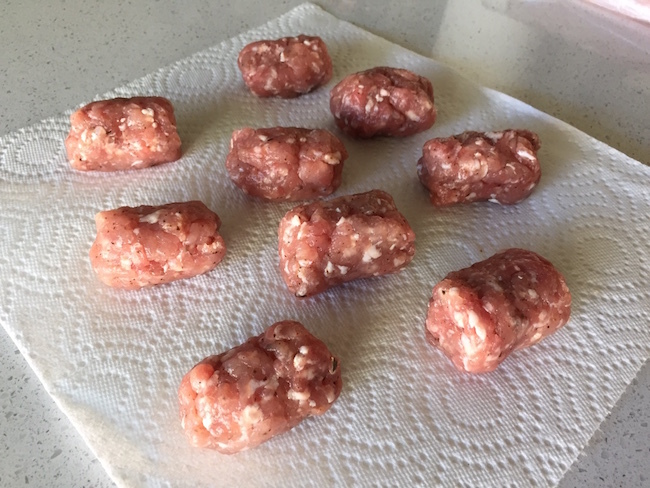 It has been a looong time since my last post, so to come back with a bang I am presenting my latest creation – Bacon Wrapped Sausage Balls with Stuffed Mozzarella! 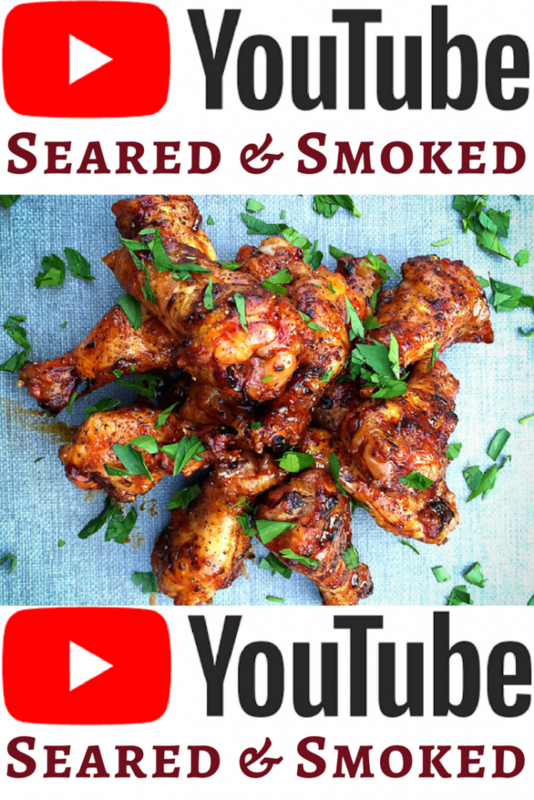 These are a great snack to throw on the smoker when you are doing a longer cook or a fun appetizer to serve guests when have them over. They are rich and salty so you will not need a ton of them for each guest – a couple per person should do the trick. 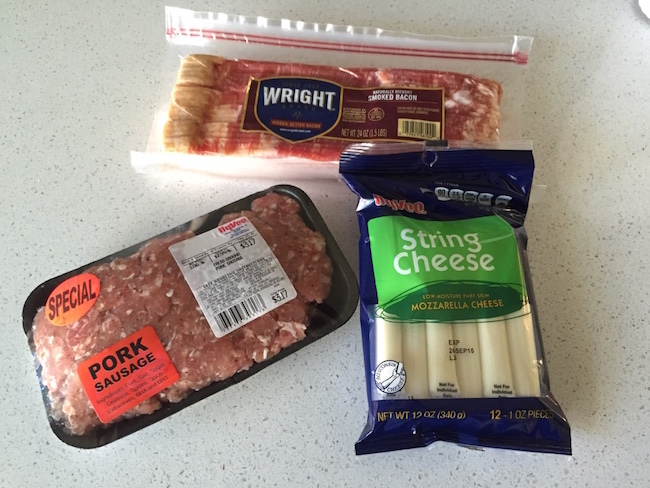 Only three ingredients needed – a good pork sausage, string cheese, and your favorite bacon. I find a thicker cut bacon works a lot better than the thin cheap stuff for most bacon wrapped snacks. Keep it chilled until right before assembling and it will be a lot easier to handle. I used a mild pork sausage for this cook. For smoking, I like any sausage that has enough fat in it to stay moist. I find some italian sausage to be too dry. Experiment to find your favorite. 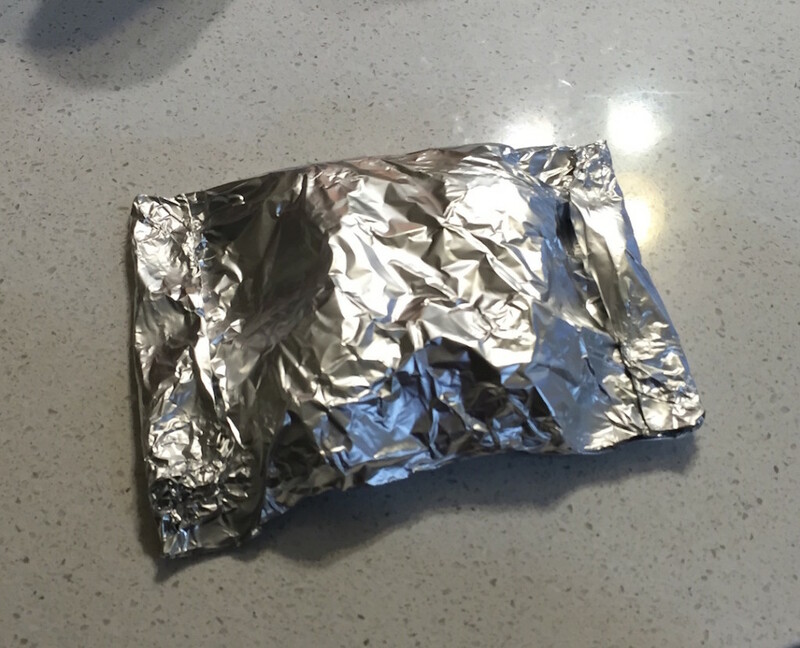 Step one is to spray down a piece of foil with non-stick spray and make little patties out of the sausage. 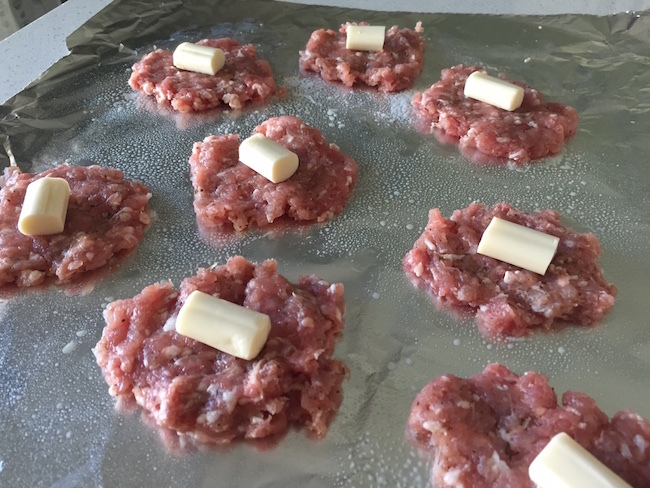 Then cut the string cheese into pieces that are slightly smaller than the sausage patties. Then gently wrap the sausage around the string cheese. You should end up with little oblong nuggets about the width of a golf ball. 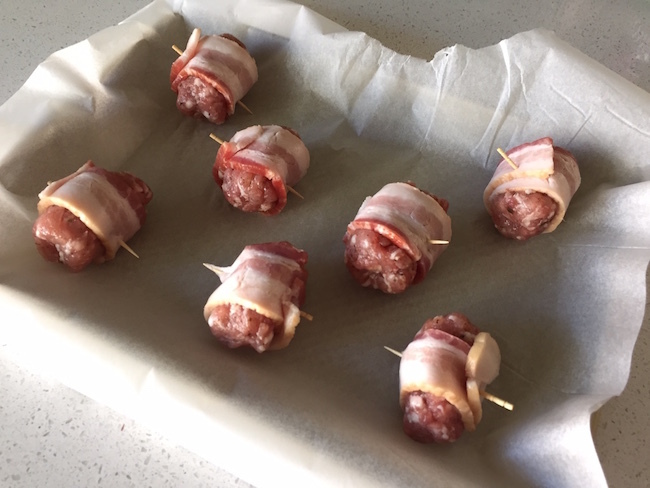 Then wrap the sausage with half a piece of bacon (or more as needed) and pin it with a toothpick. 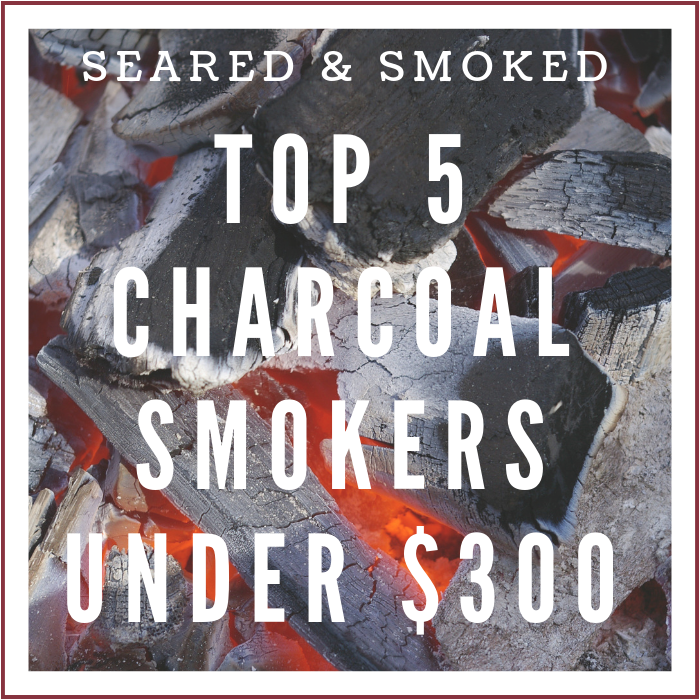 Heat your smoker up to 300 degrees and add a chunk of good smoking wood. My faves are apple, cherry, and oak. Then place these little bundles of joy on the smoker for about one hour. Rotate every 30 minutes and check for the cheese poking out of the sausage for a clue on when they are done. Serve these with some sweet BBQ sauce, as you want some sweetness to compliment the salty bacon & sausage. Give these a try and let me know what you think. 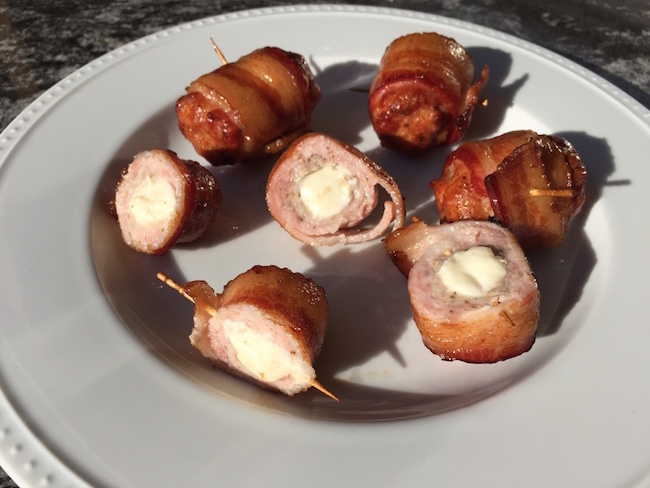 The salty smoky deliciousness of these bacon wrapped, mozzarella stuffed, sausage balls will be a hit at your next backyard cookout. Smoke for approximately 1 hour or a little more if needed more. Watch for the cheese coming out the side as a clue to when they are done. Last weekend my wife was out of town. So… I got crazy and made two of my favorite appetizers for dinner. When I am at a restaurant and I cannot make up my mind on what to eat, I will go for the appetizer platter if they contain 2 out of 3 items: potato skins, mozzarella sticks, and chicken wings. So, I covered the wings in my last post. 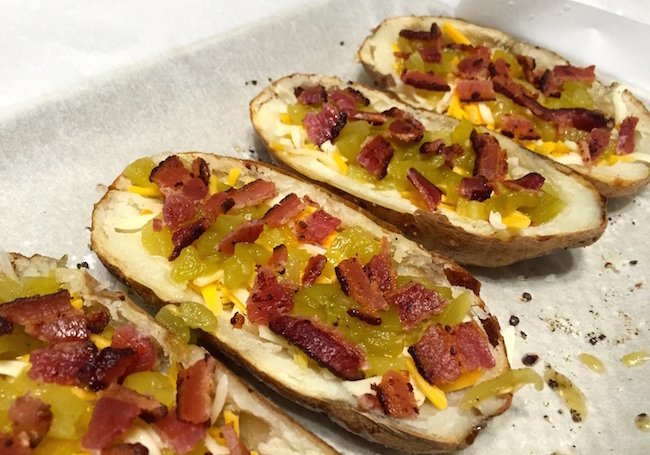 This will cover my twist on potato skins…. 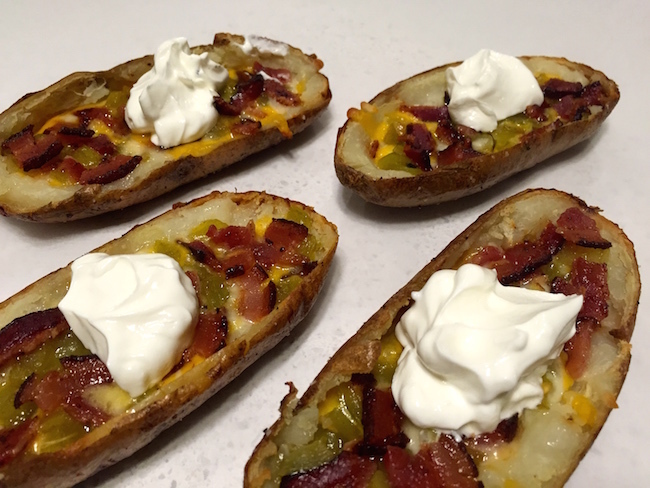 Green Chile Bacon Potato Skins. I lived in New Mexico for a few years after college, so I have a strong love for green chiles. 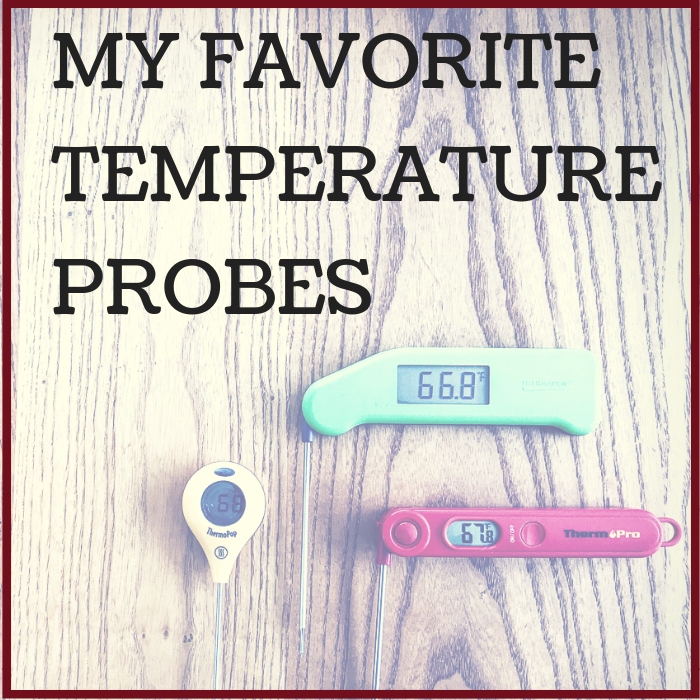 They go great with about anything you would enjoy bacon with… eggs, potatoes, burgers, etc. I think you will love these tasty little boats. 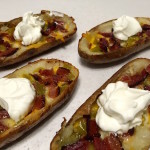 We are using medium Russet potatoes for this recipe, which are your standard baked potato variety. They have a thick skin unlike some potatoes, making them idea for potato skins that need some structure and strength. I roasted mine at 425 degrees for 1 hour. You know when they are done by pressing on the skin. If they are done you will feel an empty pocket behind the skin, like it has pulled away from the flesh of the potato a little bit. Pull them out and let them rest until cool enough to handle. 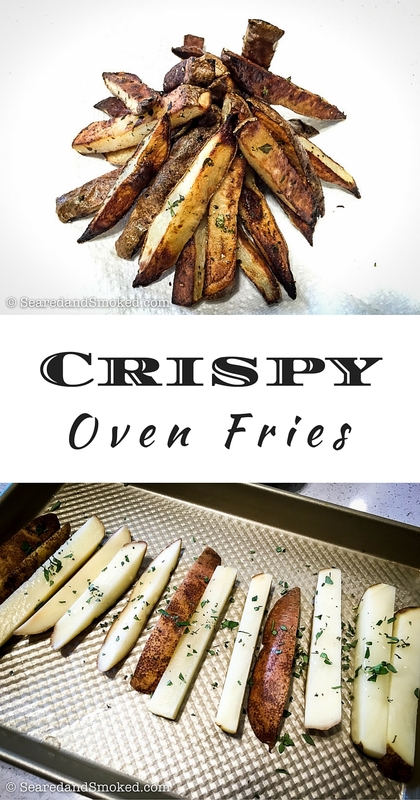 Cut them in half and scoop out the meat of the potato. You then want to coat the skin with olive oil and sprinkle with coarse salt and pepper. Then flip them over and fill with our ingredients. 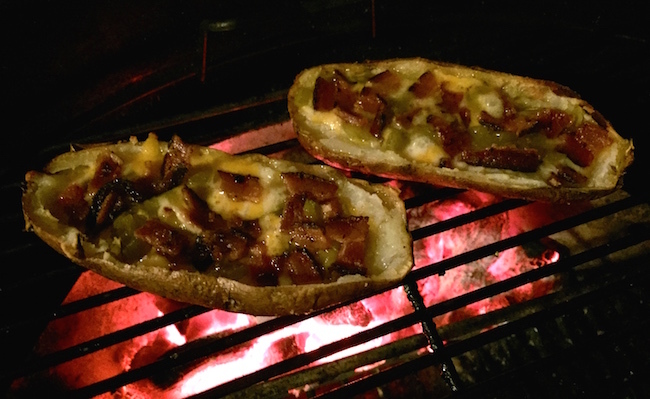 Butter, cheese, green chiles, and bacon… enough said. Place them on the grill over low heat or indirect heat for 15 minutes and then finish over direct heat for 5 minutes to crisp up the skins. When bubbly hot and crispy, pull the skins to decorate with toppings of your choice. I like to keep it simple with sour cream. I hope you enjoy this small twist to a classic favorite of mine. If you give them a try, let me know what you think. 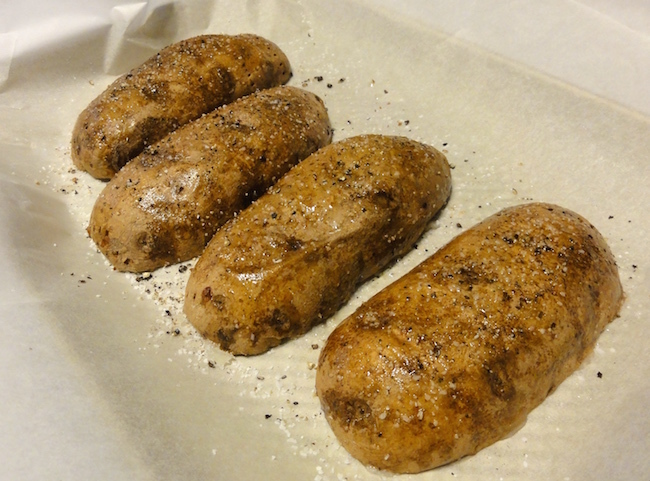 Bake potatoes directly on the rack for approximately 1 Hour or until soft. Rotate them every 20 minutes. It should feel almost a little empty behind the skin when you press on the potato skin with your finger. Saute the bacon until it gets a little crispy. Chop up or rip apart into small pieces. 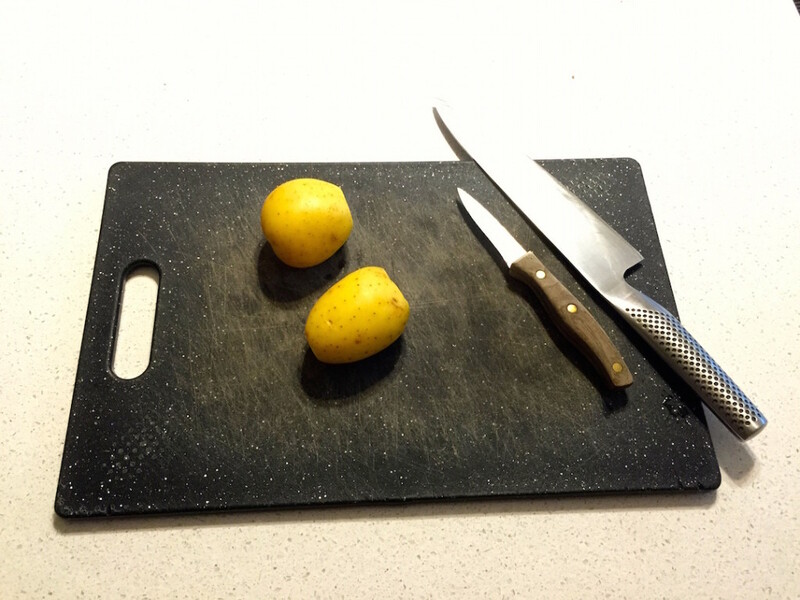 Cut the potatoes in half and remove the flesh of the potato. Flip skins over and brush with olive oil. Salt and Pepper the skin sides. 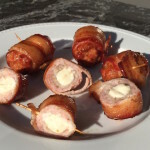 Place 1/2 Tablespoon of butter in each skin and then fill with cheese, green chile, and bacon. Heat grill up to 350 degrees and place the skins over low heat or indirect heat. Cook for 15 minutes. Finish the skins over high heat for 5-10 minutes to crisp up the skin. Remove from heat and top with sour cream for serving. Another evening grill session with not a lot of time to prepare or clean up. 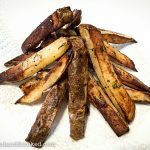 When I want a simple tasty side, I often make grilled baked potato packets along side a steak, burger, or chicken breast. Growing up around campfires we often made “hamburger surprises” which were foil packets loaded with potatoes, ground beef, and onions. This is a simplified side dish inspired by those experiences. 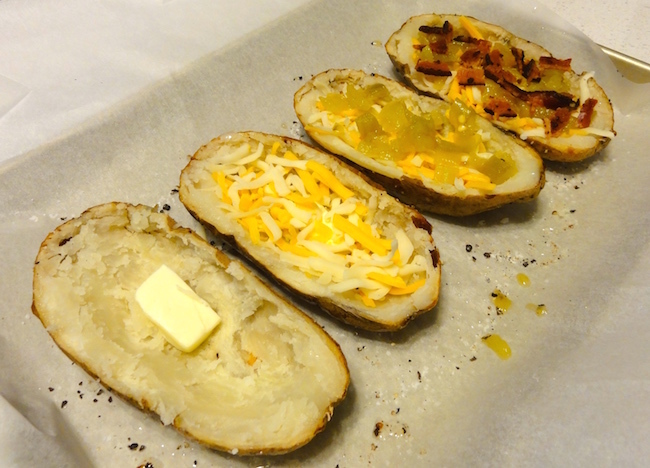 The first step in making this delicious grilled baked potato packet is selecting a good potato. 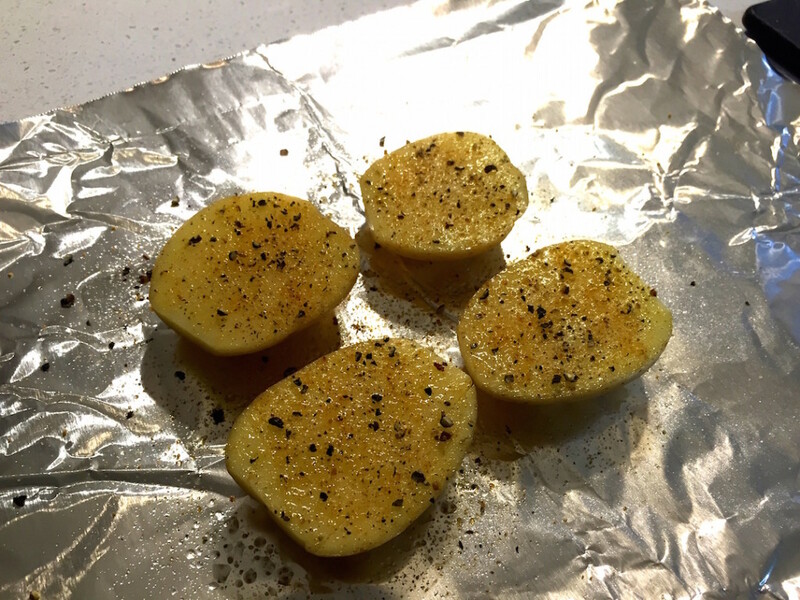 I always use Baby Red potatoes or Baby Yukon Gold potatoes. 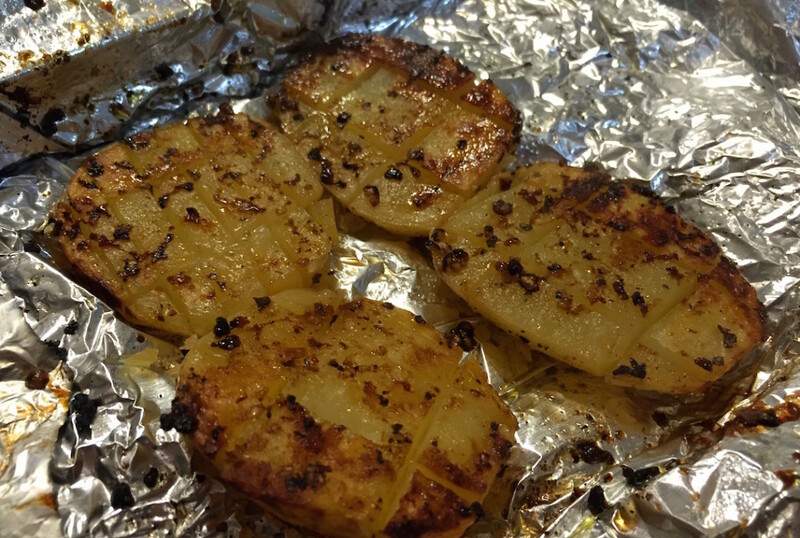 They are nice and sweet and cook pretty fast compared to large Russet potatoes. 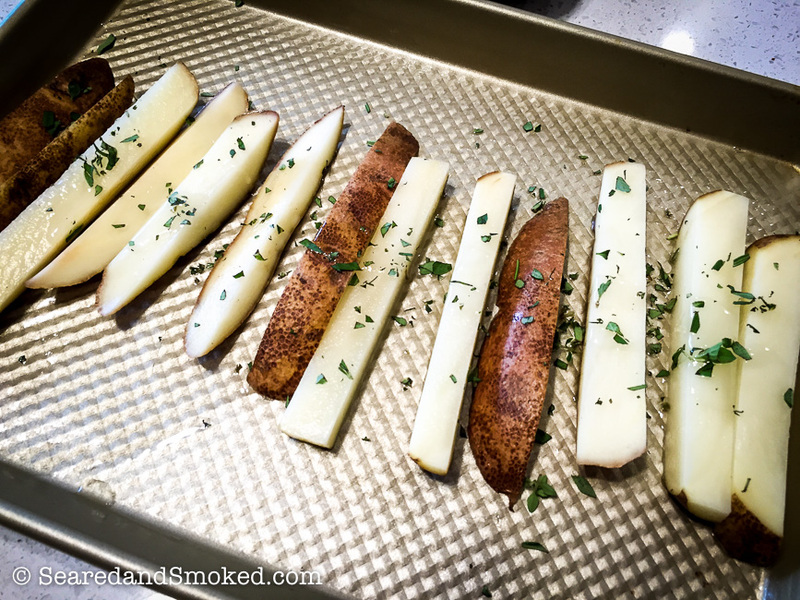 Typically I will use potatoes that are about 2-3″ in diameter. Bigger than a golf ball for sure, but way smaller than a baseball. Tonight I am making dinner for myself, so just two small potatoes will do the job. The first step is to cut them in half, trying to create 4 equally thick pieces. 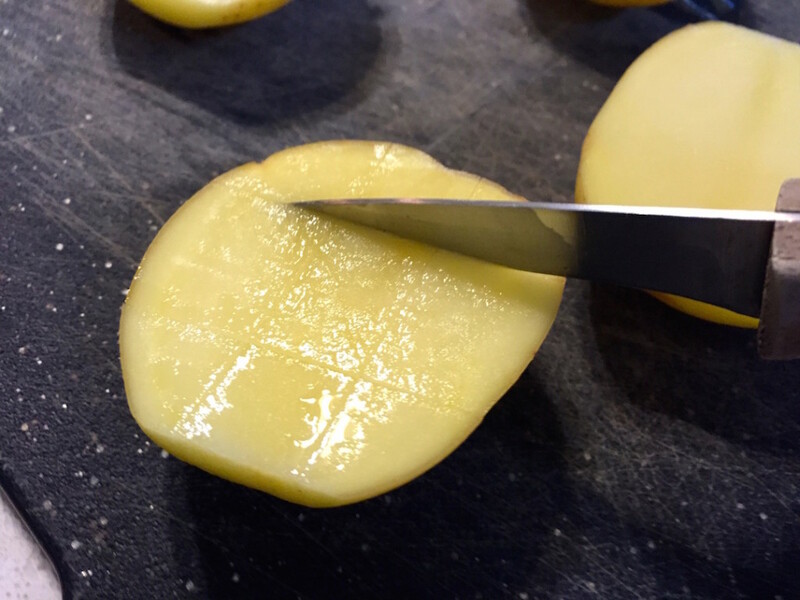 Then, score the potatoes about 1/4″ to 1/2″ deep with a paring knife. 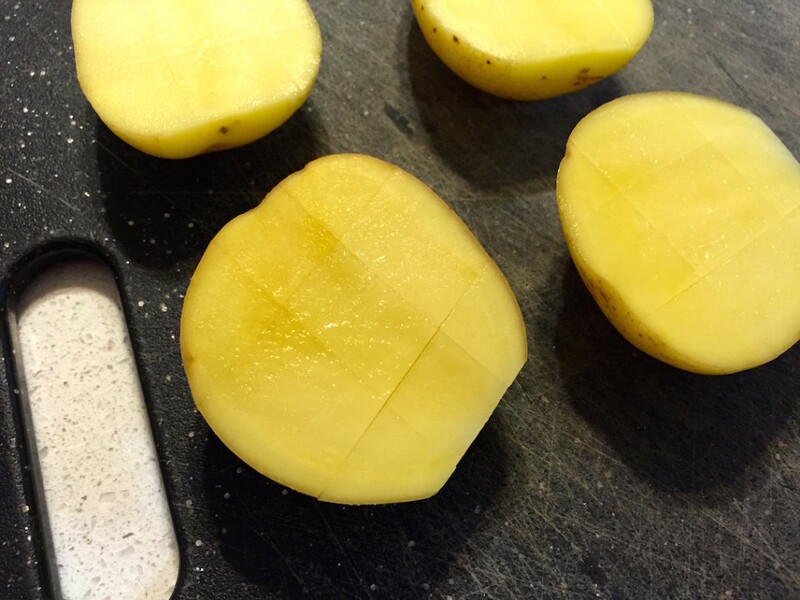 Score the potatoes in each direction to create a criss cross pattern. This allows for faster cooking and a better presentation at the end. I can thank my Grandma for this method, as she would bake potatoes in the oven using this technique. Fun as a kid and delicious as an adult. 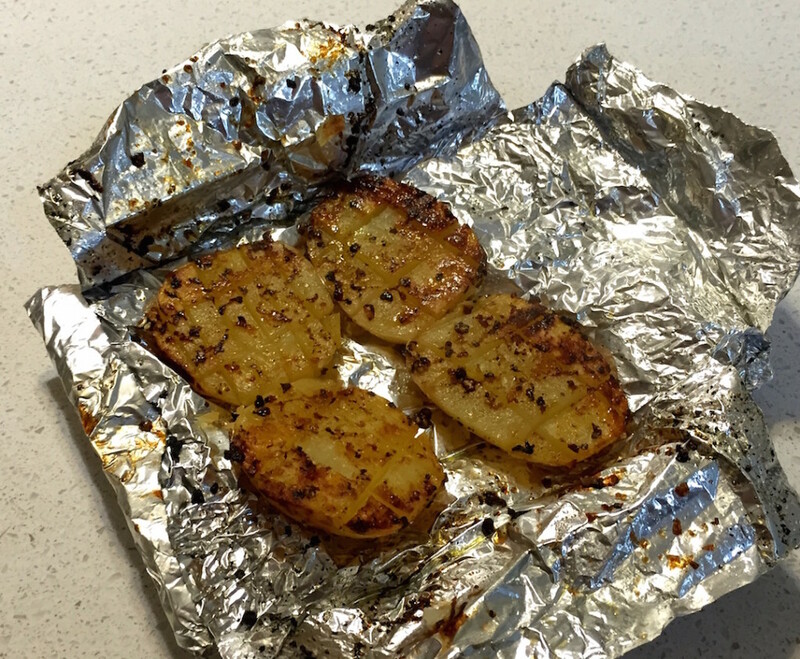 After scoring the taters, place them in a large piece of foil to season and wrap for the grill. Before seasoning coat the taters on each sided with olive oil. This will help the seasoning stick to the taters and also help with the grilling process. 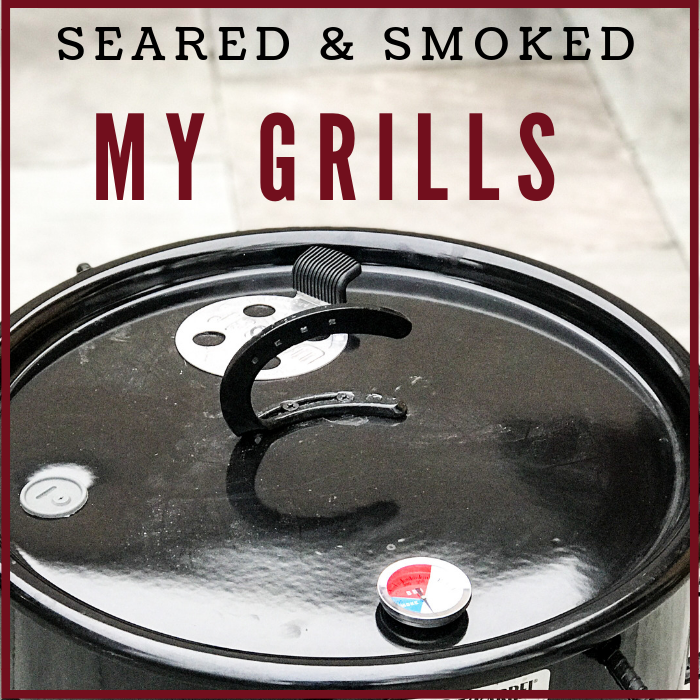 I use a simple seasoning of Seasoned Salt and Freshly Ground Black Pepper. If you do not grind your pepper fresh, please start. No shaking pepper from little plastic cans labeled pepper. You want to liberally coat both sides with pepper and salt. Adding a little butter or sour cream at the end will mellow out the salt and pepper. 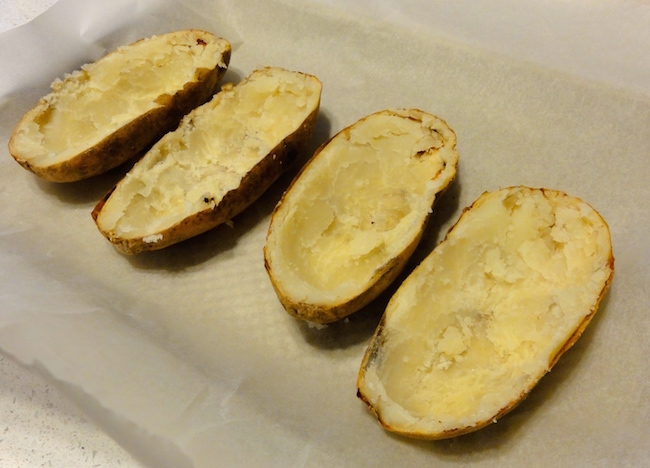 Wrap up the potatoes so they stay arranged lying flat against the foil. Then heat up the grill to 400-450 degrees. Add some sour cream and/or butter and serve. Toss the foil and you have a no mess dinner side ready to eat. Simple but tasty. 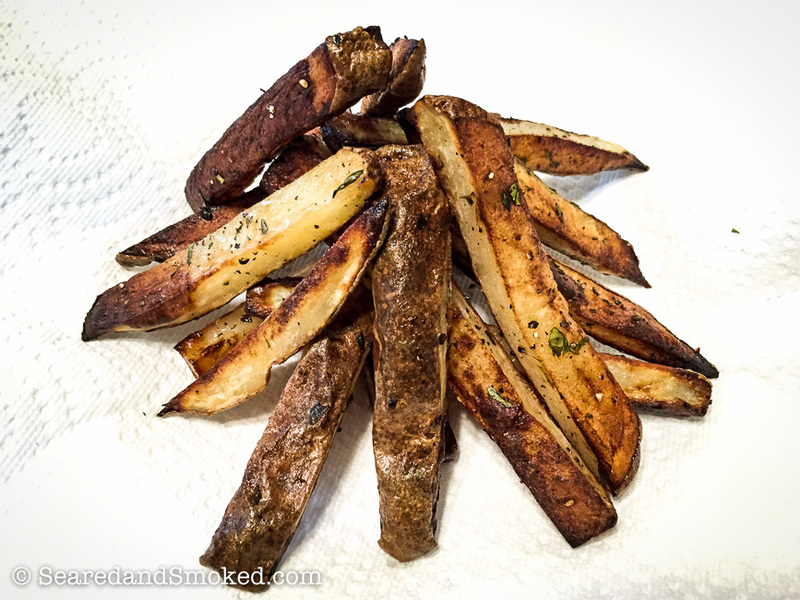 All sorts of rubs can be used to season the taters in place of salt and pepper. However this is my weekly standard. Enjoy!